The event was organized in response to the “Feinstein Challenge” which was created by humanitarian Alan Feinstein, to teach kids the value of community service. He has donated mil­lions of dollars to Rhode Island schools and has pledged a one million dollar giveaway by matching what other organizations can raise to combat hunger. The total raised at the event was $1,520, of which Feinstein agreed to match half for the school, plus proportional matching from the Feinstein million dollar challenge, making an overall total of more than $2,300, according to Pere. He explained proceeds would be distributed with $ 750 to the Bradford Jonnycake Center, approximately $750 to the Bradford school through Feinstein matching, and the balance to other Westerly area agencies, e.g. WARM, Harvest Home and the Pawcatuck Neighborhood Center. In addition, an estimated 100 pounds of non-perishable food items were collected the night of the concert, coming at a time when food pantry shelves need to be filled. 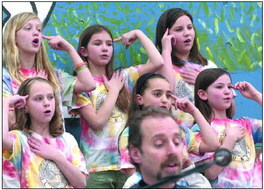 Bradford School 4th and 5th graders sing during the LUNCH concert, held at the school. 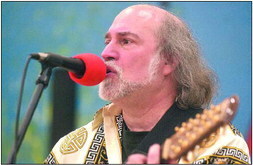 LUNCH founder, Bill Pere, sings and plays guitar at the concert. 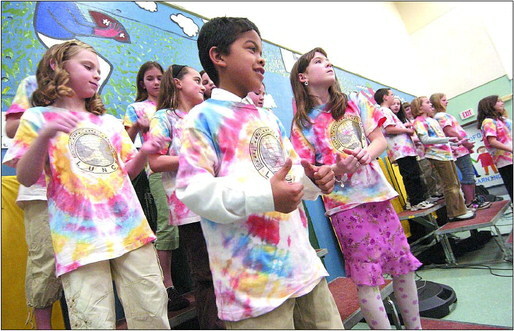 Bradford School 4th and 5th graders sing at the LUNCH concert. 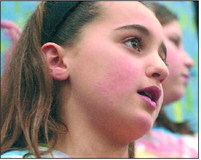 Above-left: Bradford School 5th-grader Rose Serra sings at the LUNCH concert,held at the school. 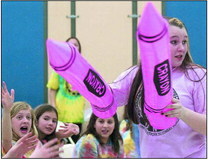 Above­right : Rachelle Seney of Ledyard hands out giant crayons to an excited audience.